Batik Club meets on the Second Saturday of the month from 12:00 to 1:00 o'clock. Your hostess is Linda Kent a long time batik lover (especially of purple batik). 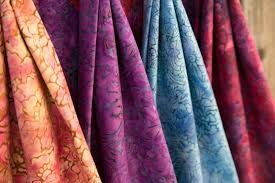 You may purchase a bundle of 6 of the newest batik fat quarters each month with 10% off the purchase as well as 10% off any batik fabric you purchase the day of the club meeting. In lieu of the fat quarter purchase, a $5.00 fee is requested.